Board the bus for Shinbashi or Iidabashi Station and get off at the International Medical Center of Japan (about 10 minutes), right in front of the bus stop. 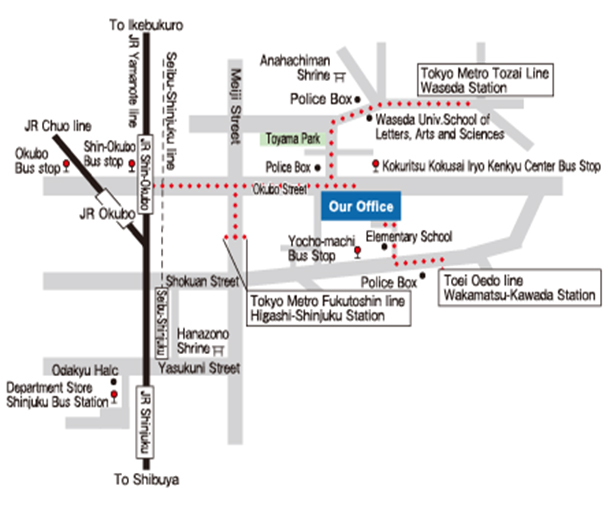 Board the bus for Tokyo Women's Medical University by way of Nuke-Benten and get off at Nuke-Benten or Yocho-machi (about 10 minutes) (5-minute walk from the bus stop). Board the bus for the same destination by way of the International Medical Center of Japan and get off at the International Medical Center of Japan (about 20 minutes), right in front of the bus stop.